The FDA must strike a difficult balance between approving effective drugs quickly and not exposing patients to drugs with bad side effects. In striving to meet these potentially conflicting goals, the FDA can make errors of two types: approving ineffective or harmful drugs and rejecting effective ones. The first type of error is a “false positive” (or Type I error, in statistics jargon); the second kind is a “false negative” (or Type II error). The standard threshold for approval in an FDA clinical trial is a false positive rate of 2.5 percent or less; in other words, the FDA is willing to tolerate approving ineffective drugs 2.5 percent of the time. But Lo and Montazerhodjat think the threshold for a successful trial should vary from disease to disease. 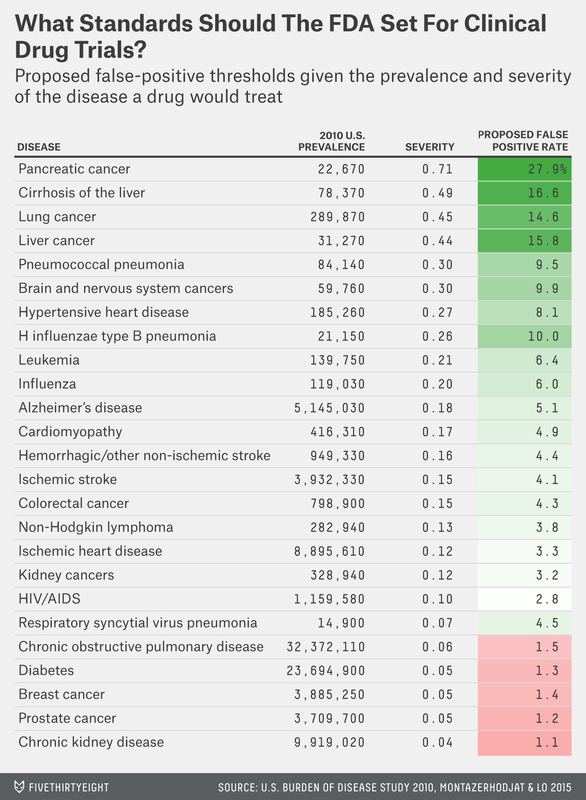 For severe diseases, the researchers think the false positive rate should be higher, to allow more drugs to hit the market even though some of them would be ineffective or harmful. A patient with a seriously life-threatening disease like lung cancer is perhaps more willing to gamble on a risky drug in pursuit of a cure, while someone with a disease that has a high survival rate such as diabetes presumably cares more about avoiding adverse side effects. On the other hand, the FDA’s 2.5 percent threshold is too high, according to this metric, for trials of drugs that treat less severe diseases. Take prostate cancer: Lo’s method says that the FDA’s standard leads to the approval of too many ineffective drugs for treating it and that a false positive rate of 1.2 percent should be used instead. For its part, the FDA resists the allegation that it’s too rigid. The agency declined to comment for this article but pointed to remarks that then-FDA Commissioner Margaret Hamburg made in March about how “clinical trial requirements have been steadily increasing in flexibility.” As evidence, Hamburg cited data on the share of drug trials using “expedited approval processes” last year — 66 percent, the highest level ever. And the FDA has made some progress toward incorporating Bayesian methods, recently issuing guidelines on “adaptive designs” for trials of medical devices. But a faster approval process is different from what Montazerhodjat and Lo are proposing. Their approach would fundamentally change the parameters of a successful trial. Statistics aside, the debate over the FDA’s clinical trial design might come down to philosophy. The trade-offs between Type I and Type II errors may seem like dry statistical quibbles, but they present, as the new working paper puts it, “utilitarian conundrums.” If the FDA were more tolerant of false positives in drug trials for terminal diseases, the U.S. might inch toward the greatest good for the greatest number.